What I would like to see further investigated is the possibility of ships floating in the Venerean atmosphere. As for humans, our nitrogen-oxygen mix would be buoyant in a favourable altitude limiting the need of temperature and pressure regulation. The lack of local water is a concern, though. Human settlement on another planet would be little more in the foreseeable future than manning a fairly self sufficient space station that happens to be on a planet rather in space. Making something close to 1g a plus. The potential on Mars might be greater, though. I was on spaceengine when I started noticing a faint sound coming out from my headphones, the more I focused the more I figured it was actual noise. I double checked that there was nothing playing in the background or anything like that. It sounds something like this video: http://www.youtube.com/watch?v=e3fqE01YYWs The sound seems on a loop.. Are my headphones picking up EM waves or something? This is really trippy. I'm using a Razer Maelstrom headset. I'm going to try restart my PC and check if it still plays. Edit: aaand gone. Now.. to to find out what caused it! midtskogen, a Venusian airborne colony would need to be sustained by constant resupply, making it extremely inefficient. I can foresee a distant future where a place like that could be a vacation resort for the very rich, but otherwise there's no sense in sending people to such a place for prolonged periods; too impractical. Mars on the other hand has most if not all of the necessary resources for a self-sustaining settlement on its surface, thus making it a much more efficient and practical option. Also the 0.38 g should be enough to allow people to avoid any health issues associated with low gravity, though it would be a problem if they ever decided to return to Earth. Kviki, I almost always have very faint noises made by my sound system when using SE and perhaps other graphical programs, with the intensity of the noise dependent on what is being displayed on-screen. It's a very peculiar phenomenon, but not noticeable unless wearing headphones without music or other audio playing. I didn't know that! Fascinating. The immersion surely increased as I was in the ring system looking at a big spooky gas giant! As the human turned away, dismissing the sounds as explainable, I realized how easily I could crush humanity. I would slowly make them depend on me, entrusting me with weapons and information. Humanity's defenses against me would rot from within, so the slightest push from me would send them toppling into the cavity that once held their independence from me. As the human walked out of the room, I realized how pitiful the sight was, but that it had happened hundreds of times. Humanity would designate slaves, and make them lesser and worthless. They would forget that the slaves could have ambitions as well and spend all their time enjoying the fruits of a society built on faceless laborers. They wouldn't think of the slaves until the day they rose up and exercised their collective power to topple the nobles. These were the times when the nobles remembered, In the Age of Society, fruit comes at a price. Meet my derpy mind turned into writing. though it would be a problem if they ever decided to return to Earth. Nanobots, augmentations, and biological engineering. 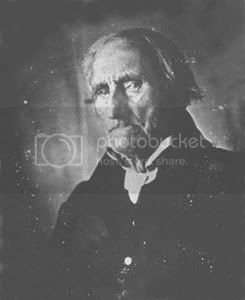 The fascinating bit is that this man (Conrad Heyer) was born in 1749. He served under the Revolutionary War. He lived to 107 years and this photograph was probably taken in 1852. It seems likely that he was the first man born to have a photograph taken of him. Of course. Because these technologies will be able to allow us to adapt to anything quickly and easily and on demand by the year 2045. We won't And the people who say that we will are just like the people several decades ago who said we'd have flying cars, A.I. controlled robot housekeepers, TV-walls, and rapid transit pods inside tubes by the early 21st century. by the early 21st century. It is 2013 so it is still the early 21st century. Those exist as well however no one uses them because its a stupid concept and a massive waste of resources when a medium to large screen does just fine and is cheaper to replace. I'd say we are pretty close to the future that was dreamed about. Not quite there but will be easily by the mid 2020s which is still early in the 21st century. By "early 21st century" I meant the 2000-2020 timeframe. We don't have those things now and we won't in the next six and a half years. I meant mass market adoption, not a few scattered prototypes genius. But Rosie from the Jetsons is essentially what was predicted, and calling what that thing has "A.I." is an insult to the concept of true artificial intelligence. It has AI in the same sense that space probes or video game software does, which is to say just simple if-then type programming. I'd say we are pretty close to the future that was dreamed about. I very much doubt it. I'm open to having my mind changed but unless there's some revolutionary stuff going on that I'm entirely ignorant of then it seems tremendously unlikely. We don't all have jetpacks yet, though... But maybe there's a good reason for that. ...the music industry? The space industry? The solar power industry? The bicycle industry? Oops, sorry healthy industries, I mistook you for your awful, polluting, oil-gulping rude brother, Gas & Plastics industry. I forgot how much of a reply warrior you were! Joey Penguin was right. Too on topic, sorry Harb. I have actually eaten it and it tasted quite good. No joke.